Yesterday I visited the special exhibition at the Art Gallery of Ontario titled The Great Upheaval: Modern Masterpieces from the Guggenheim Collection. The focus pieces were created between 1910 and 1918 by forward-thinking and often abstract artists such as Picasso, Marc, Delanay (favourite), and Kandinsky (sometimes frightening). One hundred years ago seems like a place very far in the past, but the pieces (as the title promised) had a distinct modern feel. Collections like these tend to explore themes and techniques in art, but also, the culture contemporary to the time highlighted, the dynamics of the communities of artists, prevalent technologies, and general global moods as reflected in the pieces. As someone with no formal art training whatsoever I generally dive into these things head first and figure out what to make of them as I go along. Using this strategy, here are a couple of conclusions and lessons I arrived at during yesterday’s excursion. (1) These artists turned away from materialism in interesting ways. The 1910’s were a time that many inventions took strong hold in everyday life, among them better communication through telegraph and flight, and coloured moving pictures. Unparalleled technological innovation brought about a focus on things and the materialism that we can relate to today. Artists protested this mindset in a number of ways, one of the most interesting being a change in subject matter from people to animals. Animals are not materialistic: they are genuine, emotional creatures. 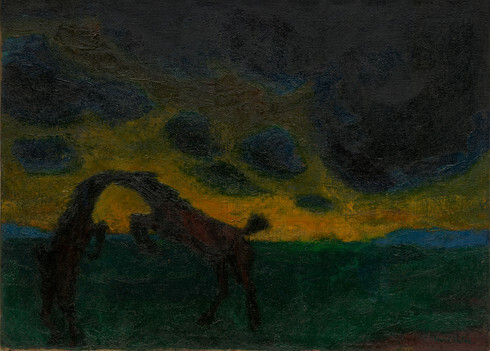 Some of my favourite manifestations of this are Emil Nolde’s Young Horses (pictured) and Max Ernst’s City with Animals. (2) Abstract art is technically challenging, especially when it has an “immediate reference in real life.” It is easy to dismiss abstract art as a shortcut to becoming an artist since lifelike duplication of a subject is not necessary. However, there are two issues with this thought. The first is that one has to only look at Picasso’s portraits to know that he was capable of relaying lifelike objects onto canvas (for instance his portrait of Gertrude Stein). The second (perhaps related) issue is that to break something into pieces you must have the whole first. 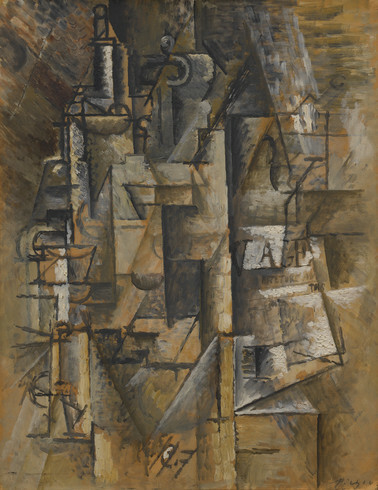 Using one of Picasso’s examples once more, Bottles and Glasses clearly represents what it is supposed to, in an organized chaos that somehow fits into place and creates both imagery and a mood. Brilliance. (3) There is something to be said for making a viewer respond to your work by using minimal brushstrokes. 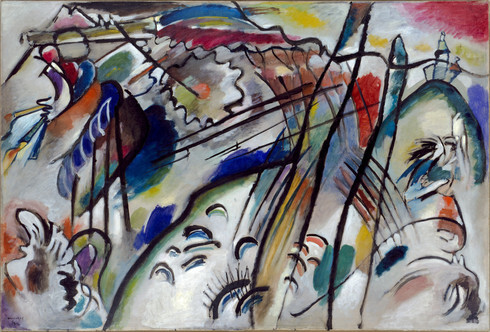 One painting in particular was not my favourite but managed to stick with me longer than most others – this was one of the compositions by Kandinsky. What left the impression was the multi-directional movement upwards and outwards, something that felt like turbulence on the left half of the canvas, and a calm empty upper-right hand corner with a bright red sun that seemed very far away. This is all in a work titled Improvisation 28. These are mere brushstrokes, most of them seemingly boldly done once, no time or opportunity for touching up or redoing. This, to me, is the most impressive thing. One chance to relay a message in a straightforward, deafening way. (1) Everybody moved to Paris. Except for New Yorkers – they stayed in New York. 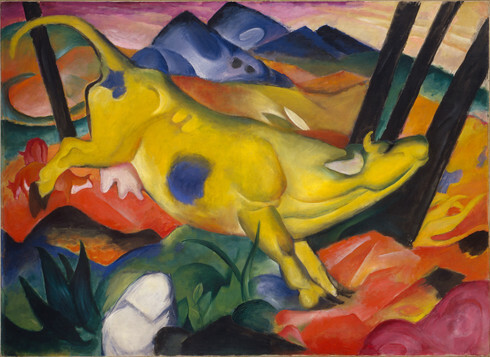 (2) Franz Marc painted his second wife as a happy yellow cow frolicking in an abstract field – and this was a loving gesture. This actually made sense after some explanation from a gallery guide. (3) When looking at cubism, always try to trail behind other visitors who know what they’re talking about and listen in as they explain to their friends where the accordionist is in Picasso’s Accordionist. I will let you look this up and guess at it yourself. All images sourced from The Guggenheim Museum (The Solomon R. Guggenheim Foundation) at http://www.guggenheim.org. Accessed January 2014. Tags: abstract, AGO, Art, cubism, Delanay, Guggenheim, Kandinsky, Marc, Nolde, Picasso, The Great Upheaval. Bookmark the permalink.